This gas block replaces your existing front sight and allows the user to mount accessories to its two Picatinny rails. It is mounted by four Allen head cap screws for easy installation. Purchace our dovetail mounted flip front sight (AR 9371) to retain your iron sights. Made from high quality steel and finished with a mil. spec. phosphate coating. This gas block replaces you existing front sight. It is mounted by the use of two set screws. This gas block provides a simple, low profile design that could be used to mount our rifle length forearms to a carbine length barrel. Manufactured from high quality steel and finished with a mil. spec. phospahate coating. Made from aircraft quality aluminum and hardcoated to mil. specs. This mount attaches to the barrel of your ar rifle. It is designed to accept Picatinny style attachments. Its three mounting surfaces allow you to attach accessories such as flashlights, laser lights, etc. Clearance is provided to fit over your front sight, even with a bayonet lug. Mounts to barrels with diameters of .730 and .750 (required bushings included). Made from gun quality steel and phosphate coated to mil. specs. This suppressor offers superior flash hiding with excellent performance in all conditions. Precision CNC machined to tough military standards. Phosphate coated to mil. specs. This suppressor virtually eliminates flash and provides excellent performance with night vision. Incorporated in the design is the ability to use the suppressor in hand-to-hand situations. Made from quality steel and finished with a mil. spec. phosphate plating. This gas block replaces your existing front sight and allows the user to mount accessories to its four Picatinny rails. This gas block can be mounted by either drilling and pinning it in place, or by the use of set screws and a bonding agent. Purchase our dovetail mounted flip front sight (AR 9371) to retain your iron sights. Designed & manufactured for use in tough combat situations. This grip will fold and lock in 3 positions simply by loosening the handle, setting in desired position, and tightening. Built to install easily on a Picatinny rail. This grip mounts quickly and securely to all Picatinny rails. One quick twist allows this grip to be adjusted precisely where you want it. Simply untwist, slide to desired location, and twist to lock securely in place. Made from aircraft quality aluminum and hardcoated to mil. specs. 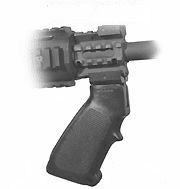 This grip attaches to any Picatinny rail and accepts a variety of standard AR15/M16 grips. Will fit on our railed forearms, gas blocks, and triple mount. Made from aircraft quality aluminum and hardcoated to mil. specs. This sling mount can be installed in minutes without the use of special tools or modifications. All that is needed is a 7/64 allen wrench. The swivel can be relocated for right or left handed shooters without the removal of the mount. This sling mount can be installed on any picatinny style rail. This product allows maximum comfort by allowing versatility in sling placement. Works great for both right and left handed shooters. Made from aircraft quality aluminum and hardcoated to Mil. Specs. 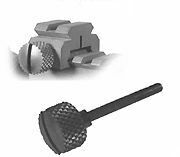 This item includes the swivel stud AR 9469. Made from aircraft quality aluminum and hardcoated to mil. specs. This adapter allows you to mount a harris bipod to any Picatinny rail. Made from aircraft quality aluminum and hardcoated to mil. specs. Available in 5 inch (AR 9474) and 7 inch (AR 9473) lengths. This extension offers extra mounting surface to your flat top upper receiver or extends off you railed forearms or gas block to accept larger accessories such as laser sight combinations. Made from aircraft quality aluminum and hardcoated to mil. specs. These risers fit any Picatinny rail. Great for elevating scopes, sights, etc. These smaller risers still increase the rise by one half inch. Made from quality steel and mil. spec. plated. Use this screw to mount our risers, sights, scopes, etc. 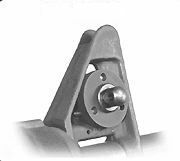 This screw offers a mounting point for a swiveling sling mount. Made from quality steel and plated to mil. specs. 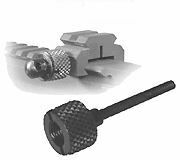 Excellent for mounting our mini risers, sights, scopes, etc. These forearms come in lengths for a 16 inch or 20 inch barrel. Features include: two mounting points for a swiveling sling mount, this allows the user to select which side is most comfortable to mount a sling on, ability to install our forearm front barrel support (sold separately) for improved reliability, and will accept our forearm system rails. The addition of the forearm front support allows the shooter to select either a free-floating barrel design or a fully supported barrel for improved reliability. 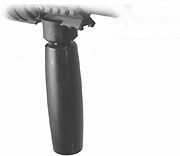 This forearm meets or exceeds the military standards of rail orientation to the barrel of the firearm. 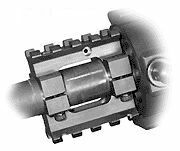 This assembly includes: one forearm tube (of specified length), one barrel nut, and one jam nut. The barrel nut and forearm tube are made from aircraft quality aluminum and hardcoated to mil. specs. 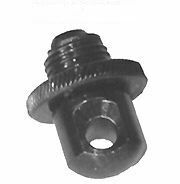 The jam nut is made from quality steel and phosphate coated. The forearm front support and forearm rails must be purchased separately. Made from aircraft quality billet aluminum and mil. spec. plated. This support installs into our forearms to add support to your barrel. Other forearms are not designed to support the barrel in any way. It simply hangs off of the upper receiver. 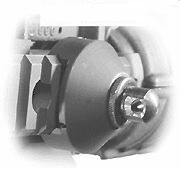 With this attachment the barrel is supported by the forearm as well as the receiver. This drastically improves the reliability of the rifle even under strenuous firing conditions. Computer designed heat venting allows for maximum comfort for the shooter and the best performance for your firearm. These rails come in four different sizes to accommodate your specific mounting needs. Made in standard Picatinny configuration, these rails mount easily to our forearm system tube with allen screws. Made from aircraft quality aluminum and hardcoated to mil. specs. Available in three inch, four inch, seven inch, and twelve inch lengths.